Jump down to:Resources and Information for effectively teaching in the field. Using Field Labs - This pedagogic module, from Pedagogy in Action, describes field labs and their use, including logistical tips and suggestions for effective implementation. 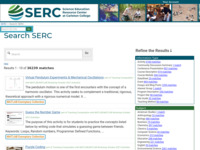 It includes a searchable collection of example activities and a reference list. 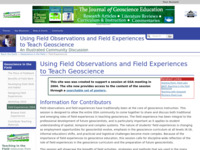 Geoscience in the Field - From On the Cutting Edge, this site hosts activities and courses, as well as a collection of posters from a 2004 GSA session on using field observations and field experiences to teach geoscience. Teaching Activities in the Field - Each of our teaching activities includes a brief summary of the activity, student learning goals, contextual information on how to use it in your class, teaching notes and tips, and suggestions for assessing student learning. You can search this collection of more than a thousand activities by topic. Teaching with GeoPads - This site is designed to help teachers and students effectively and efficiently use GeoPads (portable GIS-based mapping and note-taking computers) in field-based instructional and research activities. This site provides practical advice on selecting software and hardware, accessing and formatting data, and designing and implementing instructional activities. In addition, "best instructional practices" in using GeoPads are described, including learning goals, expected outcomes, and assessment strategies. 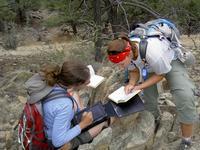 Teaching in the Field - This site, from NAGT, includes links to a searchable collection of field trips, published field guide books, and other resources on teaching in the field, including a guide to field safety. 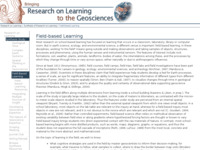 Field-Based Learning - From the Research on Learning in the Geosciences Synthesis project, this synthesis of the research on learning in the geosciences related to learning in the field focuses on the cognitive strategies necessary for learning in the field, how students learn these strategies, what methods are most effective in helping students to learn these strategies, and how to assess the impact of field experiences on student learning. A searchable annotated bibliography for over 100 resources on the topic is also available. 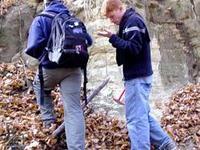 Using Field Experiences to Teach Geoscience - From On the Cutting Edge, this site hosts information, including posters, from a 2004 GSA session on using field observations and field experiences to teach geoscience.